NOTE: this feature is not implemented in the WinTopo Freeware version. This feature was designed to benefit users working with topographic contour maps, but may be equally suitable for other 3D applications. These options make it easy to assign constant, increasing, or decreasing elevation values to succesive polylines, simply by clicking on each in turn. Incremental where the elevation value is incremented after each polyline is clicked, so that each succesively clicked polyline gets the next higher elevation value. The amount of increment is specified in the Minor Inteval box. Decremental where the elevation value is decremented after each polyline is clicked, so that each succesively clicked polyline gets the next lower elevation value. The amount of decrement is specified in the Minor Inteval box. Constant where each polyline which is clicked gets the value specified in the Current/Initial Elevation (Z value) box. In order to start assigning elevations to polylines, you must press the OK button. The window will disappear, and you will see that the status message at the bottom left of the main WinTopo window shows the elevation that will be assigned to the next polyline. When you click on a polyline it will be redrawn in the colour that was specified next to the Minor Interval box, and its Z value will be set. You can press the F3 key to instantly get the Assign Colour/Elevation (Z value) window back so that you can modify the behaviour for the next batch of polylines. You will notice that there is a box marked Major Interval on the window. Here you can specify a value that is a multiple of the value in the Minor Interval box. Any polyline that is assigned a level which is a multiple of the Major Interval will be drawn in the colour next to the Major Interval box. You can set the colours for minor and major intervals by pressing the buttons marked Palette... or Pick. The Pick button makes the cursor change to a until you click on a pixel. The colour of the selected pixel is used. You can use this facility to set the colour of polylines, even if you are not interested in setting the elevation value. 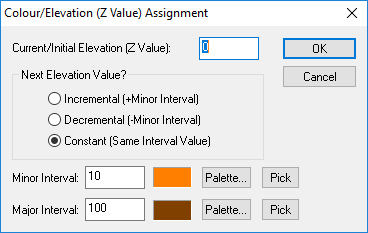 Just pick a colour for the Major Interval and leave the rest of the options as default. Then click OK and select the polylines which you want to assign the colour to. When the drawing is redrawn the assigned vectors will be shown back in green. To view the assigned colours select the Show Line Colour option on the View menu. When you have finished assigning elevations to the polylines, you can press the Esc key, or click the right mouse button.